This review of All Stop Medicated Skin Cream provides a detailed analysis of the product and it helps the customer decide whether to try this product or not. 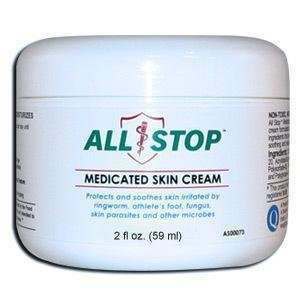 All Stop Medicated Skin Cream is specially formulated to treat athlete’s foot, ring worm, scabies and jock itch. Although it is a sulphur based cream, its website claims that it is pleasant smelling and very effective. It is available on the product’s website as well as on other shopping websites. Read on to know more about using this product in comparison to other products that are available on the market. Although no directions on how to use this product have been given on the website, the instructions are available when you click on the link that tells you about the different sizes that are available and there it is stated that the cream has to be applied up to 2 times per day on and around the affected area until the desired result is achieved. On the website of the product, there are several options which have been made available to potential customers. For different sizes, different prices have been quoted. The manufacturer offers a return policy on the product, provided that it is returned within 30 days from the date of purchase. The customer must use the product exactly as the instructions state for a full treatment period to receive a refund. One is required to call to ask for a Return Merchandise Authorization (RMA) number within 30 days of the initial date of purchase. Your request must be accompanied by an outline of exactly how the product was used. There is a list of instructions given in the return policy that needs to be followed in order for you to get your money back. The customer reviews are mixed. For some, it has worked wonders while for others it hasn’t worked at all. All Stop Medicated Skin Cream offers a lot of options when it comes to the sizes that are available. Backed by a money-back policy, the product can be tried and if it does not work, it can be returned. However, the list of ingredients is not given in detail, so it is difficult for a customer to make an informed decision. Since the customer reviews are mixed, there is a risk of it not working for some. Jimmy Rodriguez	reviewed All Stop Medicated Skin Cream	on November 19th	 and gave it a rating of 3.